* determine predictors of strategy selection -- that is, why does a person opt for one strategy over others to obtain the desired end? The research also reflects the attention the field of communication has given to strategy issues in the past 15 years. The chapters describe research on the ways in which people achieve different goals, and summarize existing research and theory on the attainment of social goals. Readers will gain insight into many of the issues that exist regardless of the strategy being discussed. Thus, this volume may not include chapters on topics such as ways people elicit or offer disclosure, ways people demonstrate anger, or ways people create guilt, but the issues that appear consistently throughout the various chapters should apply equally to these. 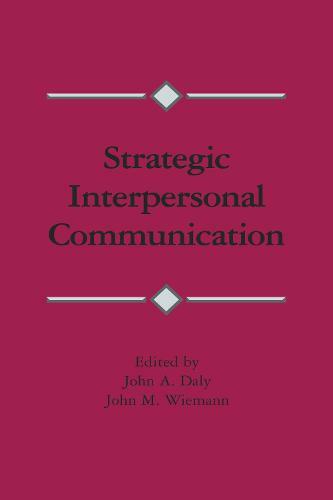 Finally, the essays in this volume provide not only a summary of what has been accomplished to date, but also an initial theoretic map for future research concerning strategic interpersonal communication.